UCLA's Jim Mora said thanks but no thanks on Friday, publicly stating he wasn't interested in replacing Mack Brown at Texas. 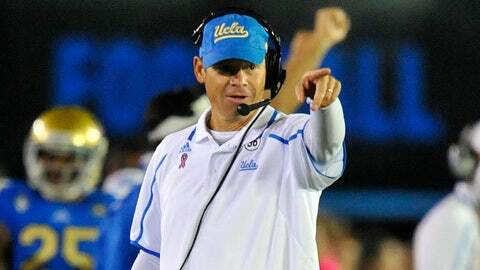 UCLA football Coach Jim Mora doused a Texas brush fire Friday morning. There were reports that Longhorns officials and Mora’s representative were in discussions for Mora to replace Mack Brown as coach. Asked about the rumors, Mora told the Los Angeles Times, "It is always flattering when someone is interested in you. But I am committed to being the UCLA coach." Texas officials made contact with Mora’s representative after Brown was fired in mid-December. Mora told them he was not interested. Mora has never deviated from his stance that Texas was not in his future. Texas Athletic Director Steve Patterson said last week that he expects a successor to Brown will be found within two weeks.